Storing boats and recreation vehicles is a highly profitable solution for your customers who cannot park their boats or RV’s at home due to neighborhood covenants or municipal restrictions. Most boat and RV owners have disposable income and are likely to store at your facility for longer periods of time. 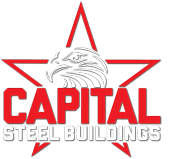 Whether it’s a roof-only canopy providing protection or a fully enclosed unit for maximum security and return on investment, Capital Steel Buildings, INC provides highly profitable, American made storage solutions for your customer’s with boats and RV’s.